One of the reasons for converting MP4 to OGV on Mac is that you want to insert an MP4 video to HTML5 page with high quality. As you know, OGV is a lossy video format codec with Theora, which can be played with browsers like Firefox, Google Chrome and with no Flash container involved. OGV is the best choice for HTML5 when you need to embed high-quality videos. Likewise, it may be difficult for you to be able to have two parts of a television show in a .ogv format. You may not be able to play those type of files in a Windows Media Player. You may also like to use a PowerPoint presentation although the .ogv format will not work so that you need to convert OGV to MP4 in order to use it. You may also want to use iTunes although the files may have the extension of .ogv which cannot be imported for playing. These issues can be overcome by using the conversion tool. Method one: Using a desktop converter to convert MP4 to OGV on Mac. Wondershare UniConverter (originally Wondershare Video Converter Ultimate) is what we recommend as the best MP4 to OGV converter for Mac. It supports over 1000 video and audio formats for conversion, and you can finish the process within 3 simple steps. Edit videos by trimming, cropping, rotating, watermarks, effects can also be easily done here. And you can transfer the converted videos from your Mac to iPhone/iPad devices easily via a USB cable. Free download it on your Mac and find more video-related functions from this MP4 to OGV converter. 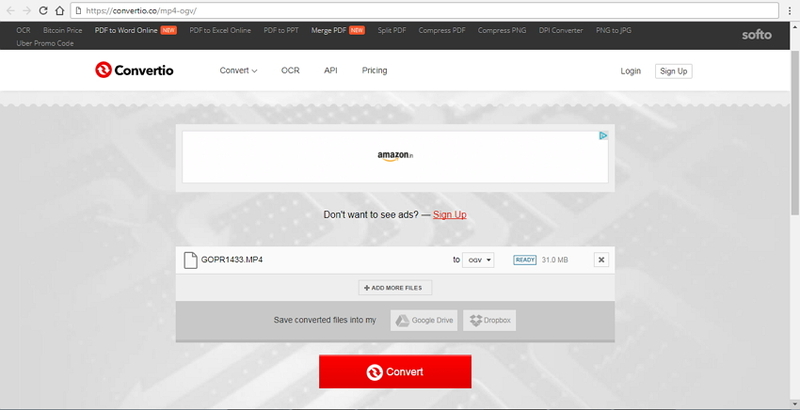 Directly convert MP4 to OGV or OGV to MP4 and convert among over 1000 formats. Convert videos in batch at 30X faster speed compared with common converters. Before starting the MP4 to OGV conversion, you should firstly download and install Wondershare UniConverter (originally Wondershare Video Converter Ultimate) on your Mac. Windows users can take similar steps too. Step 1 Open Wondershare MP4 to OGV converter Mac and import MP4 files. 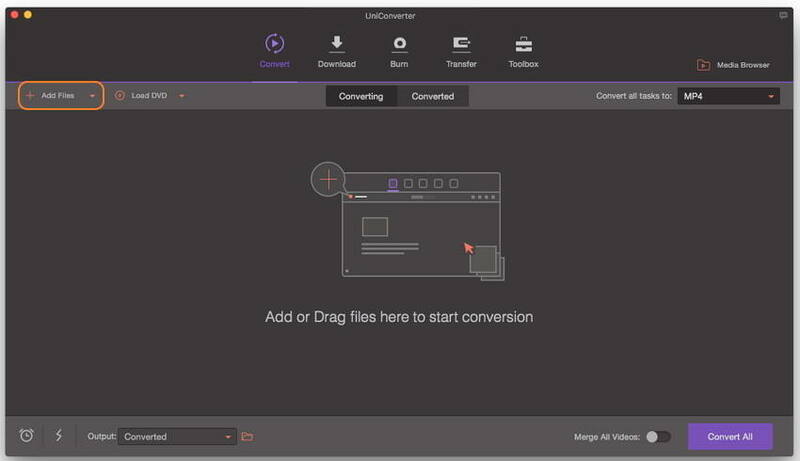 Launch Wondershare UniConverter (originally Wondershare Video Converter Ultimate) on your Mac, and click on the Add Files button to add MP4 files you want to convert. You can also import the MP4 files in batch by simple drag and drop. Step 2 Select output format as OGV. Click the drop-down icon beside the Convert all tasks to: option, choose OGV and the related resolution from the Video category. You can also click on the Create Custom button to change more video settings such as frame rate, encoder, bit rate, etc. Step 3 Start converting MP4 to OGV on Mac. Click the Convert All button to initiate the MP4 to OGV conversion on your Mac. It will take seconds to get the desired OGV files. You can click the Output icon at the bottom of the main interface to find the final OGV files. Method two: Using online converter to convert MP4 to OGV on Mac. All you need to do is to select one online video converter like Convertio to add files and then convert one format to the other. Step 1: Ready for you to use MP4 and upload to this online video converter. The video converter takes a little time which depends on your Internet speed and the file size to process and you can upload the files that you need. Step 2: Select the target folder you want to save the file, Google Drive or Dropbox. And then click Convert to start the MP4 to OGV online conversion. Step 3: Download the converted OGV file from website. There are many online converters that are available to use, so it can be confusing to choose. However, Wondershare UniConverter (originally Wondershare Video Converter Ultimate) allows you to have a better quality of files. Some issues are that you will need to have Internet access and some converters can take time to download. You may also experience some issues with the video quality in some cases and size limitations. Wondershare UniConverter (originally Wondershare Video Converter Ultimate) package should offer you a better package overall. You may decide to opt to pay for a converter although this will not necessarily mean that you will gain more. The main difference is that you will not have so many adverts. The difference between a paid converter and the one that is free is that you would hope to achieve more. This is partly true as some paid converters do offer more options such as additional functions with regular updates. The speed can generally be faster and you can receive some additional support. Overall, it can save you time. Obviously, it will cost you some money. Some free converters are really good as they can offer you some quality, although not as good as the paid ones. You will have to accept a lower operating speed for a free one. You could try a free converter first and then opt for a paid one at a later date.